Great way to start treatment of your tattoo. It takes more time to see significant changes in your tattoo, we recommend you should commit to the program to see favorable results. EIGHT (8) full size containers. Take advantage of our deep discount pricing and watch your tattoo go away. Great for larger and multiple tattoos. FIVE (5) full size containers. Most tattoos will require a treatment program at least this long in duration, so take advantage of these savings! THREE (3) full size containers. 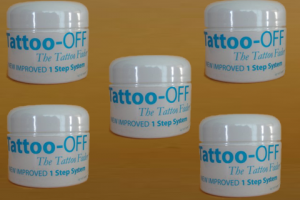 This package is perfect for lightening up an old tattoo to be replaced with new art or to fade away a tattoo forever. Whatever your desired end result is, you’ll benefit from the savings! Best Savings! TWELVE (12) full size containers. Great for treating large or multiple tattoos. Or share with a friend and save! Take advantage of our discount pricing! Orders ship within 48 – 72 hours in unmarked generic boxes. 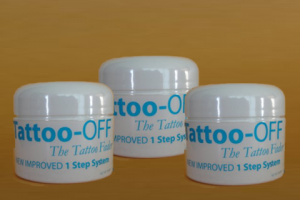 Tattoo-OFF does not sell your information. Terms & Conditions: Month estimates are approximate, and can change based on size of tattoo and how much is applied. Tattoo-OFF has been proven to be highly effective. 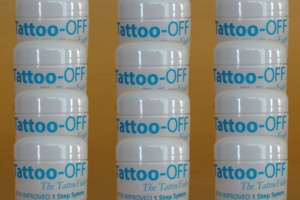 Our studies show that most Tattoo-OFF users achieve SATISFYING RESULTS, but some situations require a longer treatment period. Because of this and contamination concerns we are unable to offer an unconditional guarantee. 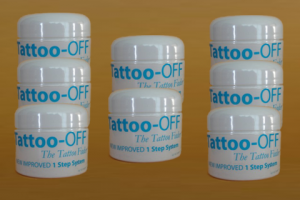 Tattoo-OFF is shipped in generic plain packages. Most orders ship within 48 hours. In the US please allow 5-10 days for delivery. Worldwide please allow 7-21 days for delivery. YOU MUST USE A PHYSICAL ADDRESS NOT A PO BOX or APO FOR FEDEX AND FAST SHIPPING. FedEx domestic is 2 day and order must be received before 10:30 am E.S.T. to be sent that day. FAST SHIPPING CHARGES ARE NOT REFUNDABLE.